LS is the Lexus flagship from the beginning. That title has been briefly taken by the LFA and now by new LC, but nevertheless, LS is a critically important model for brand’s image. The story of its sale success has been rather odd, as the best numbers were achieved in the first decade upon its introduction on the US soil. Despite Lexus being all new and unfamiliar brand for the Americans, for the first sales year LS has been sold in over 42,000 units making it its personal record unbeaten till today. After world crisis in 2008, sales have been halved in the American market and, in a constant decline, we are at around 5,000 units for the last year which is sort of an insult for glorious predecessors. Sales in Europe are not worth of mentioning strolling around below 200 units annually, so Toyota’s luxury division has to turn the tide and upcoming 2018 Lexus LS should be that turning point. The outgoing model was introduced in 2006 and if we try to calculate it means that it is 11 years on the market and all while belonging to the top, full-size luxury segment, the one that sets the bar for the whole automotive industry. Despite two redesigns, later one in 2012 bringing new fascia and totally new interior, over a decade of lifespan is just too much. Even if we are looking at the above-mentioned drops in sales, LS is still good global seller right after Mercedes’s S-Class, but for any serious take on Europe, LS will have to boost its offer by significant margins. There are few problems with it as it lacks in technology department and driving dynamics compared to German rivals especially in recent years. The new model is coming as we speak, as it is about to be revealed at Detroit Auto Show which is currently staging in the US. It will be its fifth generation, and we should expect a lot from it same as Lexus does. It should be something totally new and possibly exciting as eleven years of life on the market for the outgoing model is more than enough for a preparation of proper successor. We are on the verge of seeing its new looks, but even at this point, we do know more than a bit about it. LF-LC concept was revealed in 2015 with an intention to show us the glimpse of future LS. I believe that most of us considered it too radical and far away from the actual production model, but bare in mind that new LC almost doesn’t differ from concept, so we could be pleasantly surprised with the arrival of new LS. Lexus has been kind to grant us one teaser picture, from which we see the latest evolution of Spindle grille, this could be predicted, but we can also see contours of the headlights showing some resemblance to the one found on the concept. The old model was pretty huge and bulky, while the new one, which was clearly visible from the spy shots, is going to be significantly leaner and elegant. We dare to say its shape will remind us on Quattroporte‘s one enriching offer in traditional and rather conservative class. New LS is going to share Global Architecture-Luxury platform with LC, and since that model managed to keep top luxury with interesting dynamics presenting Grand Tourer connotation in the best light, we are more than satisfied with that. That means it will feature rear-wheel drive, but AWD would also be the must on the options list. If it keeps concept dimensions, it will be sized as the outgoing model in LWB version, which is in tune with German competition. By taking LC platform, it will feature same suspension setup but with anticipated tweaks for enhancing the comfort part, made possible by use of air springs. On the engine field 5.0-liter, V8 is probably the future base version, while also expect mandatory hybrid version, presumably same one as in LC model. In the Japanese market, it will carry cameras instead of mirrors as Japanese have been first to step in the future in that department allowing mentioned solution previously seen only on concept cars. 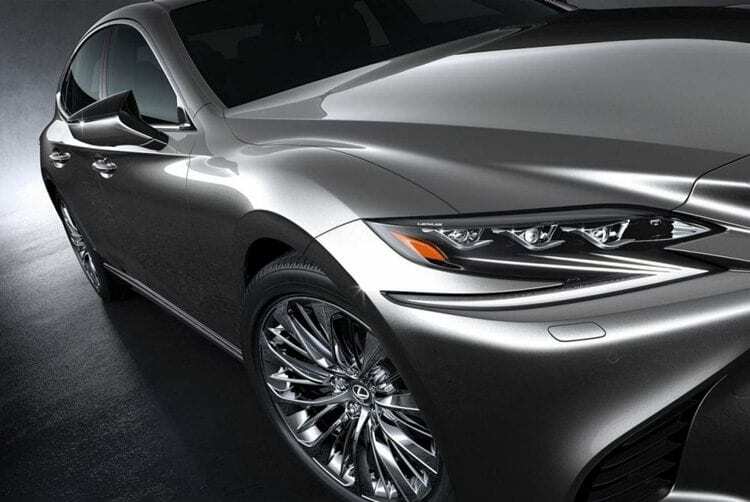 Plenty of more details will be soon available for 2018 Lexus LS and be sure that it will be delivered by us.